LAS VEGAS -- It's only Jan. 2, but fight of the year for 2016 might already be locked up. Defending UFC welterweight champion Robbie Lawler (27-10) recorded his second defense at UFC 195 on Saturday by defeating challenger Carlos Condit by split decision after five entertaining, back-and-forth rounds inside MGM Grand Garden Arena. Judges Tony Weeks and Derek Clearly each scored the bout for Lawler 48-47. Judge Chris Lee had it 48-47 for Condit. ESPN.com scored it 48-47 in Lawler's favor. Both fighters survived early knockdowns in what continued a two-year tradition of razor-thin title fights. Since 2014, all four 170-pound championship fights have gone into the fifth round, and two have resulted in split decisions. "Carlos is a helluva fighter," Lawler said. "He comes from one of the best camps in the world and had a great game plan. We battled it out. There were two winners tonight. Let's do it again." Condit (30-9), who fights out of Jackson-Wink in Albuquerque, New Mexico, was gracious in defeat, even though he felt he did enough to lift the title from the champ. "I knew he was going to come out guns blazing," Condit said. "Even if you think you're winning, you have to fight and have to win the last round." Talk of a rematch of the fight, which drew a reported audience of 10,300, began immediately after it concluded. UFC president Dana White, who scored the fight for Condit, was noncommittal on the possibility. "We'll see how thing plays out. You can't make these kinds of fights right after the fight, you know? I'm sure Condit would like to do it again ... I respect both guys a lot, and we'll see what happens. Those two were just in a five-round, absolute war. Let's see how they feel in a few days." Considering the 48-47 scores, the fight did come down to the last round. After being outstruck by Condit in total strikes 42-6 in the fourth, Lawler came out with a sense of urgency in the fifth. Even against Condit, who is known for amazing endurance, the champion was able to hurt him with punches against the fence. Condit never went down in the final round, but it was clear he was rocked. He fell violently backward into the cage after absorbing a Lawler left hand and began bleeding from the mouth. He ultimately responded with strikes of his own as the fight ended, and the crowd roared as they traded exhausted punches in the pocket. "Not neurologically, but I'm lumped up a little bit," Condit said when asked if he was hurt in the fifth. "I felt I had three rounds in the bag, but that's why you don't leave it to the judges." The 31-year-old later said he would need to reassess his next move following the disappointing result. "I've been at this a long time, over 40 professional MMA fights and kickboxing. I came up short tonight. It was kind of a do-or-die moment for my career, I feel like, and I was all-in. If I got that strap, I'm going to keep fighting. If I didn't, like I didn't, I have to see if I can continue doing this." It was Condit who drew first blood in the opening round, when he knocked Lawler down with a lead right hand. Lawler bounced immediately back to his feet and answered by knocking Condit down with a counter right hand in the following round. The third round was arguably the closest of the fight. Condit looked to take advantage of his range, as he peppered Lawler with side and front kicks. Lawler, who fights out of Coconut Creek, Florida, preferred to pick his shots and attempted to use footwork to work closer to his longer opponent. He landed a hard counterright elbow midway through the round. Overall, Condit out-landed Lawler in total strikes, 198-78, according to Fightmetric. He wobbled Lawler with a right hand to the temple in the fourth round and appeared to be on the verge of another knockdown, but Lawler threw back dangerous counters that backed him off. Neither fighter attempted a takedown during the five rounds. Other than a potentially broken toe for Condit, both fighters said they emerged from the fight minus serious injury. Former Strikeforce welterweight champion Tyron Woodley (15-3) had been announced previously by White as the next title contender. Condit, who unsuccessfully challenged Georges St-Pierre for the title in November 2012, drops to 2-4 in his past six contests. 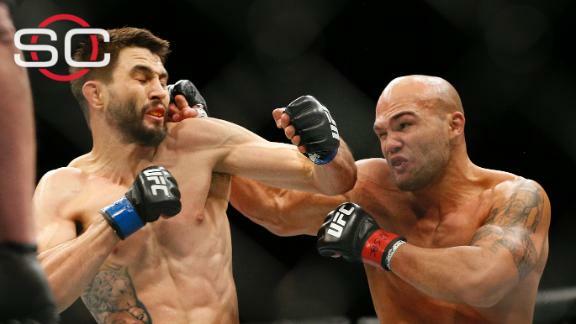 Robbie Lawler retains his welterweight belt with a split decision over Carlos Condit at UFC 195. Gilbert Melendez was thrilled with both Robbie Lawler and Carlos Condit's performance in their Welterweight Title fight and can see a rematch being the next fight for both men.